Idell Donner was born on 6 February 1908. She was the daughter of Elias H. Donner and Bertha Isabel Quackenbush. Idell Donner died on 28 August 1909 at age 1. Pearl Isabel Donner was born on 15 April 1914. Pearl Isabel Donner died on 3 May 1914. Albert J. Kahl was born on 13 August 1865 at Dane, Wisconsin. He married Lauretta R. Quackenbush, daughter of Chauncey Melvin Quackenbush and Jennie Murray, on 18 May 1905 at Dane, Wisconsin. Name Variation Iva Threewit was also known as Threewits. Married Name circa 1918 As of circa 1918,her married name was Baer. Iva Threewit was born on 27 August 1894 at Oklahoma. She was the daughter of David Lamoin Threewit and Lillian Augustus Kouns. Iva Threewit married Beauford Standsmore Baer, son of George Gilbert Nickey Baer and Catherine Zintz, circa 1918. [S250] U.S. Federal Census 1930 U.S. Federal Census, by Ancestry.com, ED30. Dwelling 47. Robert S. Baer was born circa 1920 at California. He was the son of Beauford Standsmore Baer and Iva Threewit. Married Name Her married name was Threewit. Name Variation Lillian Augustus Kouns was also known as Kuntz. Married Name Her married name was Threewits. Lillian Augustus Kouns married David Lamoin Threewit. Lillian Augustus Kouns was born on 16 October 1876 at Texas. She was the daughter of Augustus Kouns. Lillian Augustus Kouns died on 13 July 1964 at Kern, California, at age 87. [S243] U.S. Federal Census 1920 U.S. Federal Census, by Ancestry.com, ED84. Dwelling 178. Name Variation David Lamoin Threewit was also known as Threewits. David Lamoin Threewit married Lillian Augustus Kouns, daughter of Augustus Kouns. David Lamoin Threewit was born on 15 November 1872 at Kansas. He died on 11 July 1962 at Kern, Calfornia, at age 89. On 21 September 1918 at World War I Draft Registration, Riverside, California. Name Variation Amelia Dischler was also known as Emelia. Name Variation Amelia Dischler was also known as Emilia. Married Name Her married name was Heiser. Amelia Dischler married Jacob E. Heiser, son of Jacob Heiser and Elizabeth Liegel. Amelia Dischler was born in June 1894 at Wisconsin. Amelia Dischler died in September 1979 at age 85. [S250] U.S. Federal Census 1930 U.S. Federal Census, by Ancestry.com, Year: 1930; Census Place: Franklin, Sauk, Wisconsin; Roll: 2609; Page: 6B; Enumeration District: 0013; Image: 120.0; FHL microfilm: 2342343. 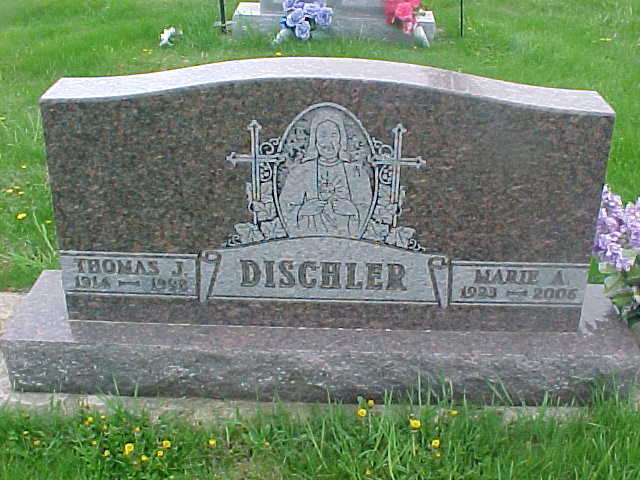 Married Name 18 February 1941 As of 18 February 1941,her married name was Dischler. Marie A. Reisinger was born on 18 January 1923 at Sauk, Wisconsin. Marie A. Reisinger married Thomas Joseph Dischler, son of Joseph Dischler and Mary Laubmeier, on 18 February 1941. Marie A. Reisinger died on 20 June 2006 at Sauk, Wisconsin, at age 83 Marie A. Dischler, age 83, of Plain, passed away unexpectedly on Tuesday, June 20, 2006, at the Sauk Prairie Memorial Hospital. She was born on Jan. 18, 1923, in Troy Township, the daughter of Alois and Theresa (Roth) Reisinger. She was married on Feb. 18, 1941, to Thomas J. Dischler. Marie was a member of St. Luke's Catholic Church in Plain and loved to play cards, gardening, and take care of her flowers. Survivors include 10 children, Joseph (Betty) Dischler of Sauk City, David (Alice) Dischler of Green Bay, Janet (Kenneth) Hendricks of Green Bay, Raphael Dischler of Spring Green, Sylvia (Calvin) Hughes of Cottage Grove, Marty (Robert) Gates of Plain, Diane (Kenneth) Lyman of Green Bay, Damian (Karen) Dischler of Madison, Julie (Paul) Gaustad of Sun Prairie, and Dean (Joanne) Dischler of Sauk City; 20 grandchildren; 17 great-grandchildren; two step grandchildren; two step great-grandchildren; six sisters, Sister Mary Bede of Racine, Tillie Bindl of Spring Green, Catherine Maier of Cross Plains, Clara Pertzborn of Lodi, Ann (Albert) Maier of Mazomanie, and Helene (Vinnie) Dederich of Grayslake, Ill; two brothers, Herman (Emily) Reisinger of Sauk City, and John (Kay) Reisinger of Bellevue, Neb; four sisters-in-law, Ann Reisinger of Plain, Leona Reisinger of Madison, Maurita Reisinger of McFarland, and Lucille Reisinger of Middleton; other nieces, nephews, relatives and friends. She was preceded in death by her parents, Alois and Theresa Reisinger; her husband, Thomas Dischler; a daughter-in-law, Debra Dischler; and five brothers, Albert, William, Joseph, Edward, and Alois Reisinger. A Mass of Christian Burial will be held on Friday, June 23, 2006, at 11 a.m. at ST. LUKE'S CATHOLIC CHURCH in Plain. Father Mike Resop will officiate with burial in the St. Patrick's Catholic Cemetery in Loreto Ridge at 1:30 p.m.
She was buried after 20 June 2006 at St Patrick Loretto Cemetery, Bear Creek, Sauk, Wisconsin. Edward S. Gruber Sr. married Lucille Dischler, daughter of Joseph Dischler and Mary Laubmeier. Married Name Her married name was Berget. Agnes T. Dischler married Roger Berget. Agnes T. Dischler was born on 22 December 1933 at Wisconsin. She was the daughter of Joseph Dischler and Mary Laubmeier. Agnes T. Dischler died on 7 February 2001 at age 67. Roger Berget married Agnes T. Dischler, daughter of Joseph Dischler and Mary Laubmeier. Name Variation Lucas Liegel was also known as Luke A.
Lucas Liegel married Elizabeth T. Dischler, daughter of Joseph Dischler and Mary Laubmeier. Lucas Liegel was born on 13 October 1923 at Wisconsin. Married Name 20 October 1990 As of 20 October 1990,her married name was Stoddard. Marcy L. Gentilli was born on 19 July 1954. She died on 1 September 2004 at age 50 Marcy L. Stoddard, age 50, passed away Wednesday, Sept. 1, 2004, at University Hospital, surrounded by her loving family and friends, as they listened to her favorite song, "What a Wonderful World." Marcy was born in Madison, on July 19, 1954, daughter of Mary Jane and Michael Joseph Gentilli. She was married to Phil Stoddard on Oct. 20, 1990. Marcy graduated from Edgewood High School in 1972, and spent that summer traveling in Europe. Upon her return she began working at St. Marys Hospital until she moved to Missoula, Mont., in 1989, where she was employed at St. Patrick's Hospital. The time she and Phil spent in Missoula was one of her favorites and friendships she developed there remain strong today. Phil and Marcy returned to Madison in 1991 and she decided to pursue other career opportunities which lead her to working at Don's Hallmark, Yankee Trading Company and most recently, Savior Faire. She loved her experience at Savior Faire, which she never referred to as a job but rather that it was a "neat place to work. " The friendships she developed at Savior Faire were very evident by the "Get Well Messages and Wishes Book" from customers. She was so touched by those messages. Anyone who knew Marcy could always count on her wonderful smile and her willingness to help anyone in anyway because "NO" was not in her vocabulary. What mattered most to Marcy was family and there was no one closer to her than her twin sister, Mary. They were not only sisters, they were best friends, and during Marcy's recent stay at University Hospital, Mary never left her side. Marcy never asked anything of anyone, but we all knew she was scared and it was Mary she turned to in her last few days and the comfort Mary provided her will only be known to them. Family outings and functions were always something she looked forward to. We can now only appreciate how precious the memories will be of the family celebrating Mary and Marcy's 50th birthday at "Uncle Mick's" cabin this past July. Marcy's pride and joy were her nieces and nephews and her love for them was evident by never forgetting their birthday's or special occasions. While she loved all her nieces and nephews, it was the "Miracle Babies," Jack, Sid and Ellie, who brought her so much joy and we can now only understand why the bond between her and them was so special. We will never forget that whenever they saw Marcy, the first thing they said was "Marcy, bubbles, Marcy bubbles." Her early morning ritual was to make it a point to call her parents and see what was up and if the coffee was on or where we should go for breakfast. She cherished the time she spent with her mother in helping her in any way possible. Her Tuesday morning coffee with her father at the truck stop was their special time to talk. Marcy loved to golf, do yard work, read mystery novels, sit on the deck by the lake on a sunny day, checking out which Culver's had the best flavor of the day and an occasional trip to Ho-Chunk. Marcy will be remembered for her positive attitude on life and that great smile. She touched many lives and will be greatly missed. Survivors include her husband, Phil of Madison; her parents, Jane and Michael Gentilli of Madison; her sister, Mary Retelle and her husband, Kevin of Madison; three brothers, Michael Gentilli and his wife, Susan of Woodbury, Minn., Joseph Gentilli and his wife, Teri of Verona, and Robert Gentilli and his wife, Cheryl of Belleville; sister-in-law, Diane Gentilli of Missoula, Mont; mother-in-law, Ruth Stoddard of Spring Green; father-in-law, Roland Stoddard of DeForest; three brothers-in-law, Brian Stoddard and his wife, Kris of Spring Green, Mike Stoddard and his wife, Linda of Spring Green, and Jan Stoddard and his wife, Jennifer of Mount Horeb; three sisters-in-law, Sally Dischler of Sun Prairie, Sandy Ducharme and her husband, Dean of Spring Green, and Susie Bindl and her husband, Tom of Plain; 19 nephews; and 11 nieces. She was preceded in death by her brother, Patrick, in 1999; and brother-in-law, Bob Dischler, in 2004. The family would like to thank the doctors, nurses and staff at University Hospital and Clinics. A special thanks to Dr. Connor and Dr. Tannehill; both are amazing individuals and Marcy was fortunate to have them fighting for her. To the staff in the TLC Center, with special acknowledgement to Amalie Meyer, Chris Dressler, Karen Holets, Liz Fahlstrom, Shandra Peterson and Dr. Regan. We can't say enough about the care they provided Marcy in her last three days and how much easier they made this difficult time for us. 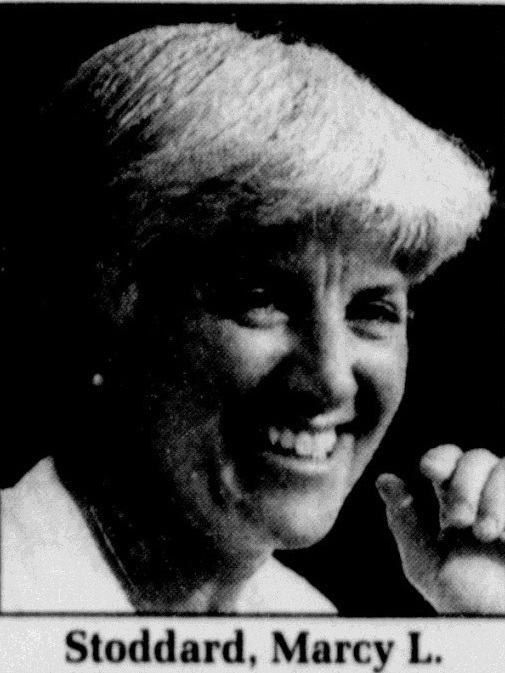 Funeral services will be held at 2:30 p.m., today, Sunday, Sept. 5, 2004, at ST. MARIA GORETTI CATHOLIC CHURCH, 5405 Flad Ave., Madison. Relatives and friends may call from 1:30 p.m. until the time of service at the church. A private burial will follow at a later date. Memorials may be made to the UW Comprehensive Cancer Center or the St. Maria Goretti "Building our Faith" campaign fund. What a Wonderful World I see trees of green red roses too I see them bloom for me and you and I think to myself what a wonderful world I see skies of blue and clouds of white the bright blessed day and dark sacred night and I think to myself, what a wonderful world The colors of the rainbow so pretty in the sky are also on the faces of people passing by I see friends shaking hands saying how do you do they're really saying, I love you I hear babies cry I watch them grow they'll learn much more than I'll ever know and I think to myself, what a wonderful world Yes, I think to myself, what a Wonderful World oh ... yeah!! Cress Funeral & Cremation Service 3610 Speedway Road (608) 238-3434 www.cressfuneralservice.com. Patrick Gentilli died in 1999. Name Variation Robert Allen Dischler was also known as Bob. Robert Allen Dischler was born on 8 October 1959 at Wisconsin. He was the son of Paul J. Dischler. Robert Allen Dischler died on 1 May 2004 at age 44 Robert A. Dischler, age 44, died on Saturday, May 1, 2004, unexpectedly while on vacation with his family in Cancun, Mexico. He was born on Oct. 8, 1959, in Plain. He was the son of Paul Dischler and Caroline (Pulvermacher) Dischler. He married Sally Stoddard on July 11, 1981, at St. John's Catholic Church in Spring Green. Bob was self employed with his brother in construction. Bob's greatest joy in life was loving and caring for his family. 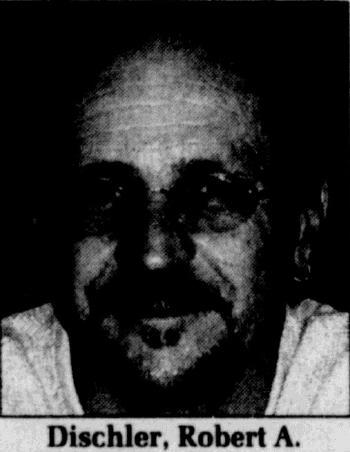 He is survived by his wife, Sally; three children, Adam, Kara and Luke all at home; mother, Caroline of Plain; a sister, Carol (Pat) Kaiser of Lodi; three brothers, Dennis (Paula) and their children, Jen, Dylan and Laura, of Ottawa, Ill., Karl (Jill) of Reedsburg, and Mark and (Jil) of Cross Plains; and nephews, Kyle and Kevin Dischler. He is also survived by mother-in-law, Ruth Stoddard; father-in-law, Roland Stoddard; four brothers-in-law, Phil (Marcy) of Madison, Brian (Kris) and Mike (Linda) of Spring Green, and Jan (Jennifer) of Mount Horeb; two sisters-in-law, Sandra (Dean) DuCharme of Spring Green, and Susan (Tom) Bindl of Plain; and many nieces, nephews, and other relatives and friends. He was preceded in death by his father and grandparents. A funeral Mass will be held at 2:30 p.m. on Friday, May 7, 2004, at SACRED HEARTS OF JESUS AND MARY CATHOLIC CHURCH, 227 Columbus St., Sun Prairie, with Monsignor Duane Moellenberndt presiding. Burial will be in Sacred Hearts Cemetery. A visitation will be held from 12:30 p.m. to 2:15 p.m. at the TUSCHEN-NEWCOMER FUNERAL HOME, 203 Columbus St., Sun Prairie. The family suggests in lieu of flowers memorials can be made to Sacred Hearts Church or Endowment fund. We love you, Daddy Skip, Bud, Princess and Mom Tuschen-Newcomer Funeral Home, Sun Prairie (608) 837-5400. Name Variation Antone Karas was also known as Anton. Antone Karas was born in December 1829 at Bohemia (Czechoslovakia). He married unknown (?) before 1864. Antone Karas married Anne (?) circa 1895. Antone Karas died after June 1905. [S245] U.S. Federal Census 1900 U.S. Federal Census, by Ancestry.com, Year: 1900; Census Place: Lemonweir, Juneau, Wisconsin; Roll: T623_ 1793; Page: 5A; Enumeration District: 79. Married Name before 1864 As of before 1864,her married name was Karas. Unknown (?) married Antone Karas before 1864. Unknown (?) died before 1905. Married Name Her married name was Pledger. Married Name circa 1895 As of circa 1895,her married name was Karas. Anne (?) married (?) Pledger. Anne (?) was born in July 1838 at Bohemia. She married Antone Karas circa 1895. Anne (?) died before 1905. Anne (?) had 5 with 4 living in 1900 children. (?) Pledger married Anne (?). (?) Pledger died before 1895. John Pledger was born in November 1859 at Germany. He was the son of (?) Pledger and Anne (?). John Pledger married Mary (?) circa 1889. Married Name circa 1889 As of circa 1889,her married name was Pledger. Mary (?) was born in April 1868 at Germany. She married John Pledger, son of (?) Pledger and Anne (? ), circa 1889. Mary (?) had 2 with 2 living in 1900 children. Frederick Pledger was born in March 1862 at Bohemia. Name Variation LaVeta Mathilda Meyer was also known as LaVita. LaVeta Mathilda Meyer married Rhinehart Hasz, son of George W. Hasz and Frieda Riggert. LaVeta Mathilda Meyer was born in 1912. 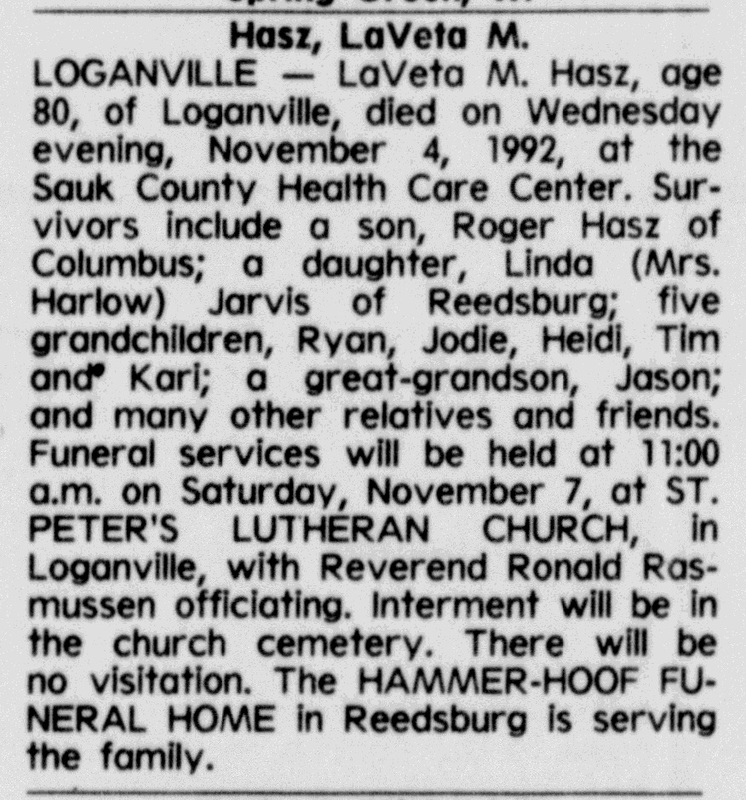 She died on 4 November 1992 at Sauk, Wisconsin, LaVeta M Hasz obituary. Paul Meyer was born on 31 August 1903 at Wisconsin. He married Elsa M. Hasz, daughter of Theodore N. Hasz and Wilhemina B. (? ), on 22 October 1924. Paul Meyer and Elsa M. Hasz were divorced before 1940. Paul Meyer died on 7 July 1991 at Wisconsin at age 87. Martha J. (?) married Arnold T. Hasz, son of Theodore N. Hasz and Wilhemina B. (?). Martha J. (?) was born in 1905. Orrlen L. Hasz was born in 1936. He was the son of Arnold T. Hasz and Martha J. (?). Orrlen L. Hasz died in 1938. 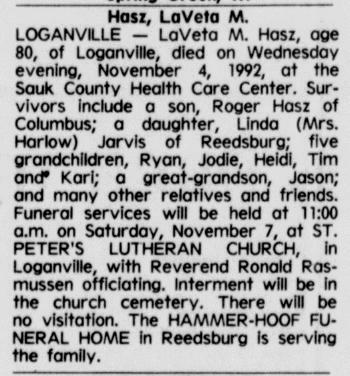 Lavera S. Kuethe was born circa 1921 at Iowa. She was the daughter of Carl Gottlob Kuethe and Emma Anna Wilhelmine Niemann. 1 January 1925 Washington, Bremer, Iowa Lavera S. Kuethe appeared on the census of 1 January 1925 in the household of Carl Gottlob Kuethe at Washington, Bremer, Iowa. Name Variation Christoph Zick was also known as Christian. Christoph Zick was born in 1799. He was the son of Erdmann Zick. Christoph Zick married Dorothe Marie Zick, daughter of Christoph Zick, on 22 January 1823 at Gramenz, Pomerania, Germany. Hans Paul Speth was born on 22 May 1875 at Wisconsin. He was the son of Hans Adolph Speth and Sophia Marie Sievers. Hans Paul Speth married Nora A. Gehrke, daughter of Dietrich Friederich Gehrke and Anna Christine Bevers, on 10 February 1904 at Lafayette, Wisconsin. Hans Paul Speth died on 17 February 1928 at age 52. He was buried after 17 February 1928 at Hillside Cemetery, Platteville, Grant, Wisconsin. 1 June 1905 Belmont, Lafayette, Wisconsin Hans Paul Speth appeared on the census of 1 June 1905 at Belmont, Lafayette, Wisconsin.